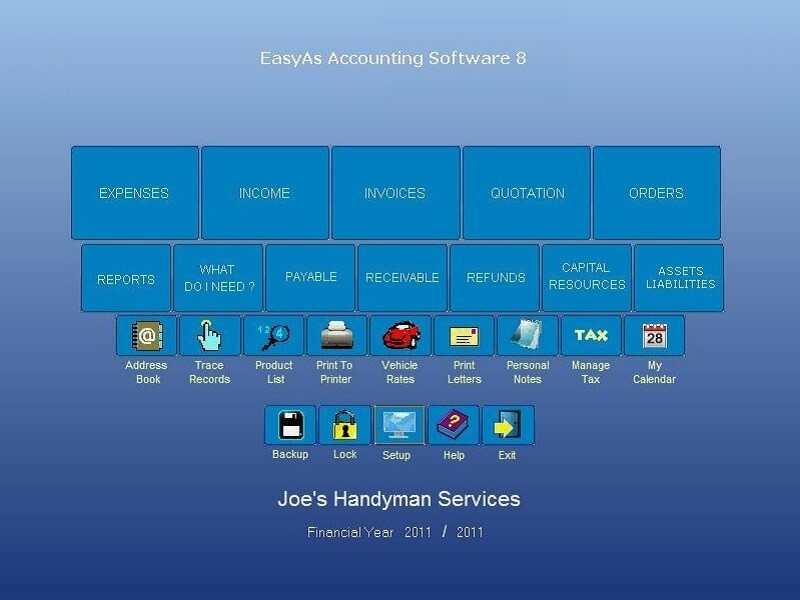 Many Small Business Owners and Contractors spend all their nights and weekends struggling with those big bulky corporate accounting programs... Why are they so hard to use?, and in an age when computers should be about saving you time... Well the answer is simple; EasyAs..
EasyAs Accounting Software has been designed using one click technology. This program allows you to obtain all the reports you will ever need, record your sales tax, issue quotes and invoices, record income and expenses, accounts payable and receivable, and a lot more, and all at the click of a mouse... With EasyAs we Do Not twist all the same figures 1000 ways to provide you with charts and an endless supply of useless reports, you only get what you truly need. Best of all we also include the Trade Mark, Where Am I Calculator. This will enable you to see at the click of a mouse how much of your sweat you need to perspire each day before you begin to make profit. It tells you what your average daily expenses are before profit... This is a must for the Subcontractor, Contractor or Small Business, and is not found in any other small business accounting software on the market..
That’s right, even if you pay 2, 3 or even 4 hundred dollars for other accounting software, they do not include the Where Am I Calculator. We are the first to bring this to the finger tips of Small Business, these tools are usually only found in corporate programs... Our clients tell us that this tool is one of the most useful tools they have, and is far more valuable than an extra 1000 reports.